Who knew? 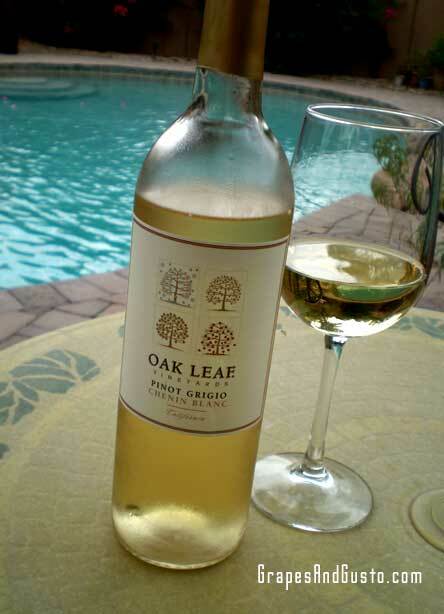 Oak Leaf Vineyards' Pinot Grigio/Chenin Blanc blend is a surprising product on WalMart shelves. The world of wine blends can seem infinite, but there are several time-honored classics that dominate the shelves. There are traditional blends, such as Bordeaux’s signature reds, consisting of up to five grape varietals: Cabernet Sauvignon, Merlot, Cabernet Franc, Petit Verdot and Malbec (though often just the first two to three are used). There are the heroically titled Supertuscans: Italian-inspired creative blends of various reds including the earthy Sangiovese grape. And there is the famed Chateauneuf-du-Pape blend from the Southern Rhone region of France, celebrated for its complex blend of up to 13 varietals (go to any late-night wine geek party to partake in a “who can name them all” contest). White and red meet on occasion, with fragrant Viognier blended in with its dark Syrah partner in some Northern Rhone wineries. Other common blends involving white wines include the classic dessert wine trio comprising Sauternes (Sauvignon Blanc, Semillon and Muscadelle), as well as Western Australia’s Margaret River region, which favors combining rich Semillon with crisp Sauvignon Blanc. However, very rarely do we see wine blends that break the mold, especially on the shelves of a mainstream, big-box store (I realize you may be crafting a “big-box wine” pun in your head at this moment). Yes, we are talking about WalMart wine. Specifically, their Oak Leaf Vineyards Pinot Grigio/Chenin Blanc blend, which happens to be priced at $2.47 a bottle – the same price as the Boon’s Farm concoctions on the shelf below it. WalMart’s Oak Leaf comes in a series of seven wines; six are single-varietal and one is our innovative blend. The line-up includes Cabernet Sauvignon, Merlot, Shiraz, Sauvignon Blanc, the Pinot Grigio/Chenin Blanc blend, White Zinfandel, and Chardonnay – the latter being the only varietal packaged in the curvilinear Burgundy-shaped bottle. A nod to its Old World roots. Nice touch. Oak Leaf Vineyard is a California-based producer who has been listed across the Internet as being part of Gallo; however, I recently found out that this was not the case (scroll down here to read a detailed profile of the true, and somewhat mysterious, origins of this “extreme value wine” giant). What is interesting about this particular Pinot Grigio/Chenin Blanc blend is that, first of all, it is an unusual combination. You just don’t find Chenin Blanc and Pinot Grigio fused together every day. Second of all – and I don’t mean any snobbery by this – I was quite surprised that they included this in the line-up at WalMart. Not that WalMart shoppers do not deserve to sample unusual wine blends, but this just seemed akin to McDonald’s having a braised short rib and mushroom risotto to-go plate for $3.59 alongside their burger menu. Uh, ok. Sure. Great, in fact, but not the expectation. Clearly, this is a wine to rival the other mass-marketed value wines (i.e., Trader Joe’s famous “Two-Buck Chucks,” or Charles Shaw wines). Apparently, it is too much to ask for a vintage date on these bottles. Or tasting notes on the back label. Or any marketing copy about the vineyards, and south-facing slopes, and the painstaking care of the harvest. Just buy the thing and take it home to enjoy on the back patio with grilled chicken and herb-roasted potatoes, as I did. From this Pinot Grigio/Chenin Blanc blend, you can expect a simple, refreshing burst of tart pear, sweet autumn apple, and a subtle cedar-like woodsy note. The best part is, this wine complements a variety of situations, not least of which includes watching Jerry Springer on the tube. I got to agree with you. I have found this wine to work in all kinds of occasions. Some of us cant afford to entertain with $20.00 bottles of wine. Why not $2.97 or in Alaska I heard its almost $4.00 bucks from comments on my site. I say wine is wine when it is under $12.00 bucks.. adventure some, you might just find what your looking for cheap! Nice site by the way like the structure. Thanks for your thoughts, Damion. It’s true, there is a certain threshold that seems to hover around $12, then another one around $25 from my experience (and so on, though not necessarily at $12 increments). Thanks for feedback on my site – if you look back you can tell it’s a fairly new blog, so much appreciated.